Governor Andrew M. Cuomo today kicked off the official opening of the 116th Annual New York International Automobile Show at the Javits Center on Manhattan’s West Side. The Governor drove a Silver Camaro ZL1 Convertible in a brief parade to kick-off the opening ceremony. More than one million visitors are expected to attend the ten-day event, the largest show of its kind in the country. The show features nearly one thousand of the world’s latest automobiles, trucks, motorcycles, and concept cars at the convention center and is expected to generate more than $300 million in economic activity for the Empire State. For the third consecutive year, the New York State Department of Motor Vehicles is operating an exhibit at the Auto Show and showcasing the agency’s most recent services, such as ordering a replacement driver license and signing up for electronic notifications when vehicle registrations and inspections are due. Additionally at the show, Governor Cuomo awarded wounded U.S. Army Sergeant First Class Jeffrey Hackett with an honorary license plate for his new 2016 Toyota RAV4 Hybrid, which was donated by Toyota. Hackett, of Mexico, NY, was serving in Afghanistan in August 2011 when an improvised explosive device detonated, causing him to lose his right leg and suffer serious injuries across this body. To assist Hackett, the RAV 4 has been equipped with special steering controls and pedals that all can be used with a left foot. During his 19 years of military service, Hackett earned more than a dozen awards, including the Bronx Star Medal, Meritorious Service Medal and Purple Heart. With an illustrious history as America’s first and largest-attended auto show since 1900, the event will showcase more than 60 new vehicles making their world and North American debuts. As the largest event hosted at the Javits Center, the Auto Show occupies nearly one million square feet, and thousands of Javits Center electricians, carpenters, cleaners and teamsters participate in the construction, deconstruction, transportation and cleaning of the various exhibits, vehicles and related materials. In 2015, members of the Greater New York Automobile Dealers Association sold more than 600,000 vehicles, supported more than 65,000 jobs throughout the New York region and contributed more than $2 billion in local and state tax revenue. In January, Governor Cuomo announced a $1 billion expansion project for the Javits Center, which will include five times more meeting room space, the largest ballroom in the Northeast, an outdoor rooftop terrace and an on-site truck marshaling facility that will relocate 20,000 trucks off local streets each year. This expansion will enable the Javits Center to attract new events, improve its operational efficiency, create 6,000 full-time and part-time jobs and generate nearly $400 million in additional annual economic activity. Construction is set to begin later this year. At the DMV exhibit in the Crystal Palace near the front entrance of the Javits Center, staff equipped with tablets and laptops are available to assist customers with a number of transactions, including registration renewals, MyDMV address changes, road test scheduling, title duplicates, accident report searches, photo document duplicates, and custom license plate ordering. Vision screenings will be offered so customers can renew their driver license online without having to visit a DMV office or an eye-care provider. Customers can also conduct business without staff assistance on a self-serve kiosk, which was introduced at the 2014 show. Kiosk transactions include license and non-driver ID renewals; registration renewals; license, non-driver ID, and learner permit replacements; and registration replacements. With every kiosk transaction, customers are given the option of changing their address and signing up for electronic notifications when vehicle registrations and inspections are due. Customers renewing a license or ID also have the options of registering to vote and signing up to be an organ donor. Known as the “Marketplace for the World,” the Javits Center was originally designed by I.M. Pei & Partners and opened in 1986. The iconic facility has since become New York’s primary venue for large conventions, trade shows and special events and serves as home to many of the world’s top 250 trade shows, hosting millions of visitors a year. Located on 11th Avenue between West 34th and West 40th streets. In Manhattan, the Javits Center generates up to $1.8 billion in economic activity and supports more than 17,000 jobs a year. The New York icon has 840,000 square feet of flexible exhibition space, 102 meeting rooms and four banquet halls, as well as a range of technology services, including state-of-the-art WiFi capabilities. For more information, visitwww.javitscenter.com. 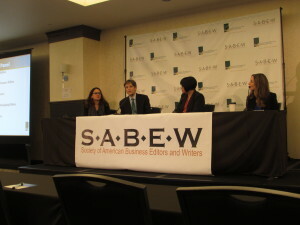 The Society of American Business Editors and Writers, (S.A.B.E.W.) along with The National Endowment for Financial Education (N.E.F.E.) supported and embraced Freelancers and Business Journalist today under a personal finance scope of thought to drive innovation in storytelling to their main audience. The displayed panelist consisted of Lauren Young, Wealth Editor, Thomson Reuters (left); Patrick Regnier, Writer and Assistant Managing Editor, at Money; Maggie Leung, Growing Team Leader, NerdWallet; and Jennifer Barrett, CNBC Digital’s Personal Finance Editor. Due to the financial crisis in 2008 and recent layoff announcements in The New York Times, topics that matter within corporate newsrooms are being addressed by paneled companies that have either restructured thought for reporters or development innovative ways of storytelling to redesign their main audience. So who are our stakeholders today in the market of business journalism? According, to the Producer/Moderator, Lisa Gibbs, Associated Press, nourishing financial thought today delivers a different business model to solve financial problems for the core audience that identifies the gap of Investigative Journalism. With digital breakthroughs to deliver breaking news content to the forward-thinking audience, a legacy of service and commitment in business is required to get an audience today to align their values. So why conduct a panel discussion if the Financial content echoes results? Well, in turbulent times, one needs to manage competent leadership. Motivating, identifying, and helping participants to understand how or what is involved about a specific issue during massive layoffs is for a panel to clarify optimism. What is important to understand today is in order to manage your business model as a business journalist, you must understand the technology that drives your story. Get Social! Get Connected with these individuals and stay in tune with your subject expertise. For more information about the S.A.B.E.W. log onto: http://sabew.org. For production information about the panelist please visit: www.nefe.org.